Working Mom Pep Talk: What Do You Tell Yourself to Keep Going? Do you feel guilty for leaving your kids to come to work? Some days are harder than others, especially when your child is sick. Here is your working mom pep talk to get you through the day. A fellow mom who wrote about the recent guilt she felt. She doesn’t usually feel this guilty for going to work, but this morning, her baby boy was sick. It seemed she only had five minutes to cuddle with him before she had to go. She hated handing him off to the nanny when she felt like she was the only one who knows how to comfort him. Maybe you’ve had a similar situation where you wish you could be home with your sick boy instead of at work. Or you second guess your decisions, both about coming in to work that day or of being a working mom at all. Feeling confident working starts with trusting your child care provider. Whether your child is with a nanny, at a daycare or with your mom, know that he’s with a trusted adult who knows how to care for him. When the guilt strikes, tell your nanny or child care provider to give him extra love and hugs. He needs it not just for being away from you but for feeling sick as well. Ask the adult who’s with your child how he did the rest of the day. More than likely, she’ll tell you he stopped crying within five minutes. Today, I went to the market alone, something that didn’t sit well with my three-year-old. While I left the house to the sound of his shrieks and cries, my husband later told me he was over it in a few minutes. It’s easy to think your child was miserable all day when the last thing you saw and heard was him crying for you. But ask his nanny how he did and more than likely he felt better after a few minutes. I do believe our bodies do strange things where we heal or feel nurtured when we’re bonded with our loved ones. That said, you being home with your baby boy isn’t going to make him feel any less out of it than if you were at work. He’ll still likely feel sick regardless of whether you’re home or not. And, like we mentioned earlier, he’s with loved ones he cares for as well. Don’t put the pressure on yourself that you’re the one and only who can cure him of feeling sick. He loves you, of course, and would like you home in an ideal world. But don’t beat yourself up if you can’t or if feel like you hold the ticket to him feeling better. Think about it this way: You don’t have to be there 100% of the time. And if you’ve ever doubted this, think about his dad and whether he’s feeling guilty for not being home. More than likely, he isn’t putting that pressure on himself, and neither should you. Worried how he’s doing? Call the nanny or daycare when you’re at work. Find out how he’s doing (where you can also learn he stopped crying when you left). See if there’s anything he needs you can buy during lunch or on your way home. And follow up during the day so you don’t feel detached or out of the loop. One of the ways I stop myself from worrying or feeling guilty is to imagine the worst case scenario. I write in a notebook what I imagine the worst possible thing that can happen because of XY and Z. You going to work while he’s home sick is not going to scar him for life. He’ll turn out just fine than if you were home with him right now. It’s so easy to assume the worst when our babies cry for us. But he won’t grow up feeling neglected because you’re at work and he’s sick at home. Make the times you’re with your child count even more. Know that it isn’t always about how many hours you have, but in what you do with them. Take care of him as best you can when you get home, giving lots of hugs and kisses. Let him know he’s been on your mind all day, and that you’re so glad to be with him at this moment. Is the guilt still there? Take a deep breath, mama. This is just one day. Think of all the other positive days and the benefits of being a working mom. Remind yourself why you’re working, both financially, for your community and for your own joy. On the flip side, let’s say the overwhelming feeling isn’t a one-off. Maybe you feel this way almost all the time and wish you could be home with him more often. At that point, it’s time to reconsider your situation and the options you have. But, if you’re like our fellow mom in the example above and this isn’t the norm, remember that the guilt will pass. As much as I enjoy the time I’m away from my kids, I’d be lying if I said I never needed a pep talk. My three-year-old has been asking me each night, “You going to work?” He doesn’t like not seeing me in the mornings. If you’ve felt guilty, remind yourself of the benefits of being a working mom. Look for alternative solutions and options. Be proactive and present the times you’re with your child. And remember, he probably stopped crying a few minutes after you left. You’ve got enough weight on your shoulders, mama. Adding on guilt—which won’t make your child feel any better—isn’t going to help. Instead, acknowledge the emotions you feel, then let the mom guilt go. 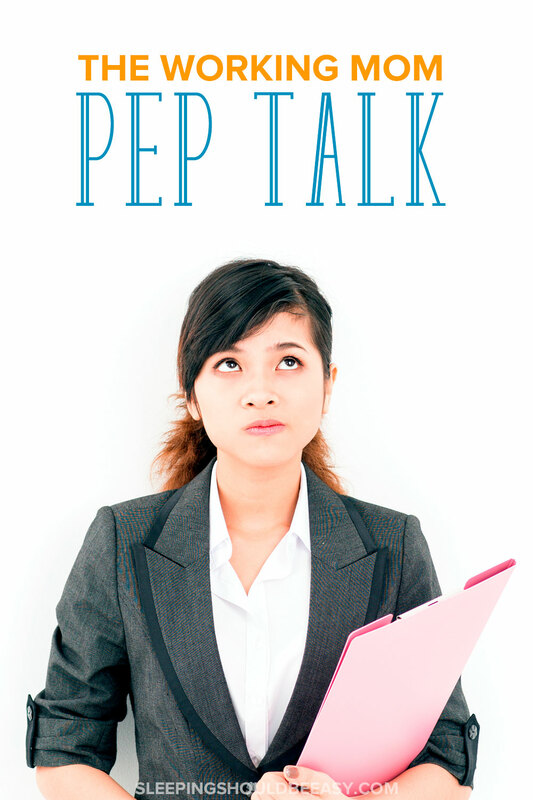 Tell me in the comments: What’s your working mom pep talk? When have you felt guilty for working? I don’t work outside the home, but my kids go through phases where they’re really upset that my husband works. It’s really helped to explain to them why he works. Since we’ve done that even the 2 year old seems to understand that Daddy goes to work so he can help people and so we can have the things we need, some of what we want, and so we can help other people have the things they need. Steph I love that explanation: that he goes to work to have things for you and for others to have things they need, too. Not to mention helping others in general. Awww. Working moms definitely need pep talks on the regular. Love the suggestion to focus on your child when you’re together. Sometimes we’ll do extra long story time before bed or just even some extra cuddles and hugs. It can definitely get hard leaving the kiddos for work. I totally agree that extra time can mean so much. We used to hear not to let the kids know a parent is home when they’re so close to going to bed (e.g. during reading time for instance) but my husband and I totally do the opposite. If he has a chance and the door isn’t open yet, he’ll run over and spend time with them before bed. And they enjoy it so much! Boy, it can be tough. Des had a runny nose and crankiness today and I felt strange dropping him off, but their rules seem ok with runny noses. Just no fevers or vomiting, etc. And I wondered if I should just scoop him up and take him home, but I need the time to work and he needs the time to let someone else care for him. Same with our preschool. Runny noses seem to be tolerated but definitely not fevers or outright illness.